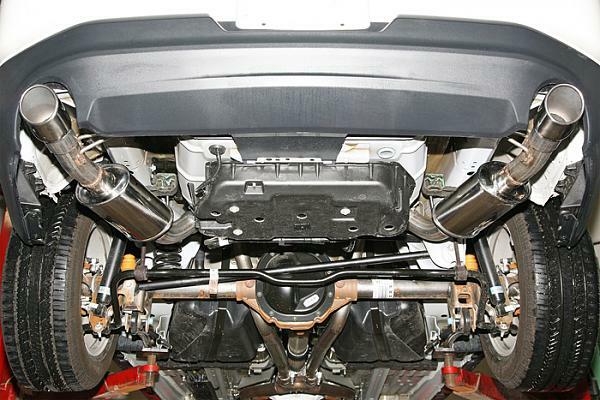 One of the first 2011 Mustang V6 performance exhaust systems on the market! The MRT Interceptor Axle-back Exhaust for 2011 V6 Mustangs delivers performance sound and improved exhaust flow, while maintaining the fuel economy and unique spirit of the V6 engine. The MRT Interceptor Axle-Back is fully compliant with common emissions standards (This is not a guarantee: check your local standards to be certain). We make all of our exhaust systems in-house at the MRT performance shop and distribution center in Plymouth, MI. The MRT Interceptor axle-back exhaust for 2011 V6 Mustangs is manufactured out of the highest-quality 304 stainless steel tubing, and features easy, direct bolt-on installation. No drilling is required to install the Interceptor Axle-Back. If desired, you could polish the exhaust's stainless steel to get a show car shine.